A solo exhibition of Swiss artist Boris Rebetez. In 'Columnist', previously shown at Kunsthaus Baselland, Muttenz, a projection of over eighty black and white photographs transform VITRINE Bermondsey Street space into an immersive installation. With his architectural intervention, Rebetez alters the physical nature of the space and activates it, creating a new environment for the viewer to inhabit. Working with the columns and architecture of the gallery, Rebetez’s photographs will be projected from within the walls into the gallery space. 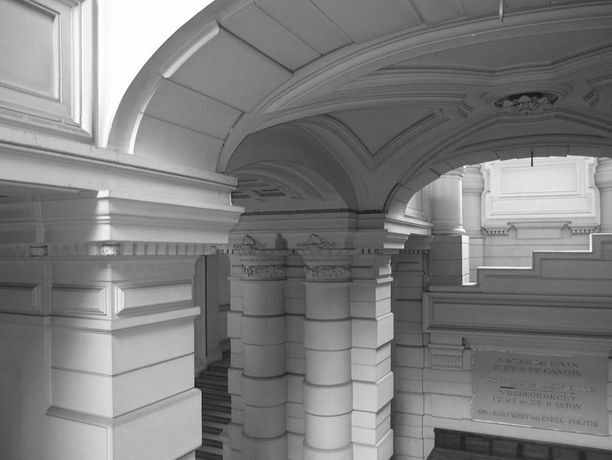 Images show details of neoclassical structures – columns, beams, pillars and arches – drawing the viewer from the urban context of the modern pillar, from which the projections stem, into a magnificent architectural past. The nature of Rebetez’s work ensures that every encounter is unique. Each viewer will enter at a slightly different time; begin watching the photo progression at a different point; experience a different quality of light and shadow in the space. The viewer will bring their very personal context to the viewing of the photographs and the associations drawn from them. The title of the installation exhibits a playful duality. ‘Columnist’ suggests a reporter who pens editorials for magazines and newspapers, whilst at the same time, in the context of the exhibition, the viewer understands a ‘Columnist’ to be the sculptor of physical columns. Taking on this role, Rebetez invites the viewer to see and experience the space in an entirely new way as a result of his interventions. In ‘Columnist’, Rebetez exposes the viewer to two potential spaces – that of the physical installation and that of the past architecture on which the photographs reflect. In doing so, Rebetez creates a transitional space, constantly fluxing between the real and imagined, past and present. Boris Rebetez (born 1970 in Lajoux, Switzerland) makes drawings, collages, sculptures, installations and photography. His work has been widely exhibited internationally, with recent solo exhibitions at Kunsthaus Baselland, Muttenz (2014), von Bartha, Basel (2013), Kunstraum, Riehen (2012), von Bartha Chesa, S-Chanf (2012), Komplot Brussels (2011) and Kunstmuseum Solothurn (2010). Selected group exhibitions include Ueberzeichnen at Kunsthaus Baselland (2015), Emergences at Bex & Art Triennale (2014), Warum ist Landschaft schön at Kunsthalle Basel (2013), Celluloïd Brushes at Ludlow 38, Goethe Institute New York (2013), Galerie Isabella Bortolozzi, Berlin (2012) and Witte de With, Rotterdam (2012), Minimallinie at Kunsthaus Palazzo, Liestal (2012), Prix Irène Reymond 2006-2012, Musée d’art de Pully (2012), Voici un dessin Suisse 1990-2010 at Kunsthaus Aarau (2011), Sichtbar Unsichtbar, Graphische Sammlung der ETH, Zürich (2010) and Voici un dessin Suisse 1990-2010, Musée Rath Genève (2010). Rebetez participated in the Art-in-building project at the Emergency Center in Bern in 2012. He received an award from the Irène Reymond Foundation in 2011 and was artist in residence at the Istituto Svizzero Roma in 2008. His work in included in notable public and private collections internationally. Boris Rebetez lives and works in Basel and Brussels and is represented by von Bartha.